Toprope soloing is the fastest and easiest way to maximize climbing with limited time at the crag. This week I will focus on standard setups and ideal locations for TR solo climbing, but for an introduction to the topic and why you should try it, please read the first article in this 2-part series. The individual hardware setup that you use and where you choose to use it are the two decisions which may seem confusing or daunting. However, there are several products and setup strategies specifically designed to work well for TR soloing, some using just the standard climbing gear you may already own. Finding a suitable location is also easy, as long as you keep in mind some of the general characteristics which define an ideal TR solo spot. The first step in TR soloing is to tie off a rope above the area you want to climb, using a bomber anchor. Static lines are best since rope stretch can be a minor annoyance, but dynamic lead lines from 9.4-10.2mm work as well. Pad any edges with a piece of cloth or the Petzl Rope ProTec Rappel your intended pitch, re-tying the rope via clove hitches to gear or bolts along the path of the climb, taking care to protect traverses and sharp edges as you would in a normal TR setup. Once at the base of the pitch and off rappel, connect yourself to the fixed rope via a device designed for moving in only one direction along the rope–allowing you to climb up easily, and never slide down should you fall or let go. 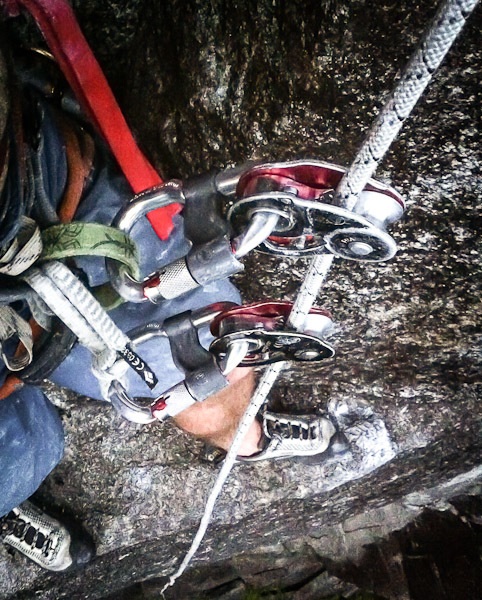 The Petzl Mini Traxion (or the newer and smaller Micro Traxion) clipped into the belay loop with a locker is the standard and most popular ascension device for TR solo climbing. 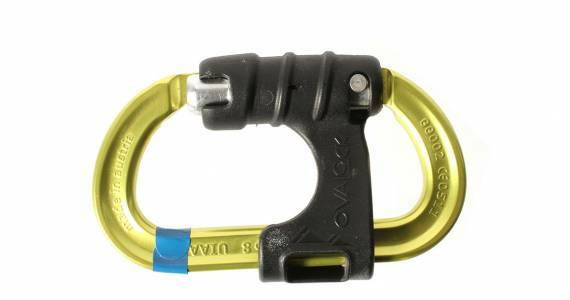 Other devices which function similarly include the Wild Country Ropeman, and Petzl Microcender, which doesn´t have any teeth, so it will be less damaging on your ropes over time. But despite widespread use of several devices in this context, there IS NO CERTIFYING TEST conducted by the UIAA or other independent group to determine which ascension devices are safe specifically for TR soloing. Use common sense about a device’s limitations and include a backup in some form, either a second device on your belay loop, held up against your stomach with a neck sling (see illustration) or dangling under your belay loop (in photo lower down). These ascension devices only move in one direction along a rope, so you´ll need a separate rappel device with with you as well. your belay loop may also be clipped to an elastic, non-weight-bearing shoulder or chest sling, such as a stretchy thera-band tied into a loop around your neck. Without an elastic shoulder strap, you can drape a standard 24” sling over each shoulder, forming an “X”, and tie your ascension device to the cross of the X with a small piece of accesory cord. This merely holds the upper device high up against the stomach or lower chest, minimizing any slack or drag. I strongly suggest using one of the new non-crossload belay carabiners to keep your device’s carabiner from cross-loading. All CAMP and Cassin harnesses also include snug-fitting anti twist belay loops, with inner slots in the belay loop to hold any carabiner in the ideal orientation. Make sure you don´t have long hair or loose fabric that can catch in your chosen device. Some climbers clip a water bottle or pair of shoes as a weight to the bottom of their rope before starting up, which helps things to feed smoothly on slabby pitches where the rope´s weight isn´t free hanging. Once you´re ready to descend, even just to re-work a crux, you will have to attach to the rope via the rappel device of your choosing and then disconnect your ascension hardware. This process requires a hands-free ledge or clipping into a piece of gear to unweight your ascender. 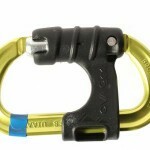 Blake, you mention the Petzl Microcender, do you have any experience using the similar CAMP Lift as one of these devices? I have seen several people say they use it on mountainproject forums but can’t find any resources on it.